At Vermont Moving & Storage we're committed to providing customized solutions for your moving and storage needs. If you're planning to store household goods for the short term or the long term, our state of the art Storage Facilities give you the convenience, safety and affordability you deserve. There have been numerous incidents reported in the media of thefts at self storage facilities due to security lapses. Self storage facilities often do not carefully monitor the identification of people into and out of their facilities. Vermont Moving & Storage has strict security standards. There is no walk in traffic through our storage facilities. Therefore, no one can have access to your storage vault without your stated permission. Within a self storage facility, there are no restrictions put on the condition of units within the facility and the items being stored. And since the partitions within the units are not completely closed, any infestation problems in an adjoining unit can affect your unit. Also, at most self storage units, your items are placed directly onto concrete floors. Direct contact with concrete is more conducive to moisture absorption, which can result in mildew forming on your belongings. At Vermont Moving & Storage, your household goods are stored in containers with built in pallets that keep your belongings 6 inches off the ground. In addition, we inspect items being placed into storage and refuse goods that are hazardous or that appear to be infested. The result is a cleaner environment for your household goods. There have been many incidents at self-storage facilities of turnover in ownership that make it more difficult to get into the facility and access your belongings. Also, within these facilities there is no record of what is stored in your unit. 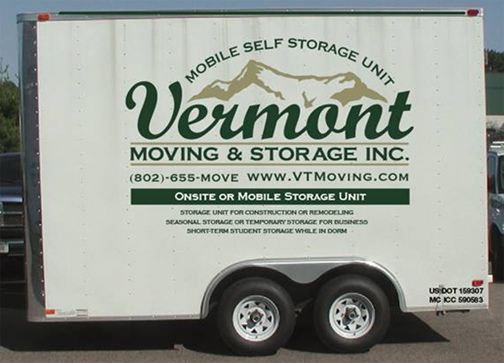 Vermont Moving & Storage is a family run moving and storage business. We are a licensed professional warehouse that assumes responsibility for the items we move into, store and move out of our storage facilities. All items and their condition are carefully documented. 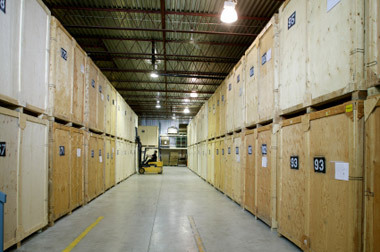 Please contact us for a free household storage estimate! Storing items to uncluttered a home when listing it for sale. Storage for college student's personal belongings between semesters. Preparing for garage & yard sales. Seasonal storage for items such as lawn furniture or holiday decorations. Temporary storage for business, or holiday travelers who will be away from home for an extended period of time. Please call today for further information! Trailer Dimensions - 8' X 12' -- Tall enough to stand a couch on end!